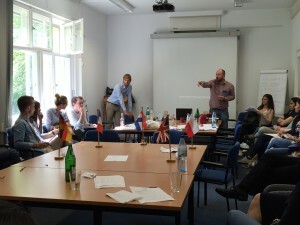 On May 12/13, the students of our Master Programme in European and European Legal Studies (MEELS), took part in a study trip to Berlin.They participated in the “WDR-Europaforum”, an annual high-level discussion forum hosted and televised by German public broadcaster WDR, as well as in a political simulation game recreating the European ordinary legislative procedure. The WDR-Europaforum provided a number of interesting talks, and panel discussions by such high-ranking European politicians as German Chancellor Angela Merkel and EU Commission President Jean-Claude Juncker, among others. To see these protagonists of European politics up close was certainly among the highlights of the trip for our students. On the second day our group, along with students of a Berlin-based Masters Programme in European Studies, participated in a simulation game hosted by planpolitik using the example of the introduction of fracking regulation through the EU ordinary legislative procedure. The students took on different roles of political actors/ countries and representing their respective interests over the course of the exercise. The result were some tough arguments and negotiations, but in the end a compromise was reached that most parties felt represented their interests sufficiently. While this might not work every time in reality, this still proved a welcome opportunity for our students to put their theoretical knowledge on the legislative process to use in a setting that was created to reflect realistic conditions as closely as possible.